How would you like to be married to the guy in the photo above? 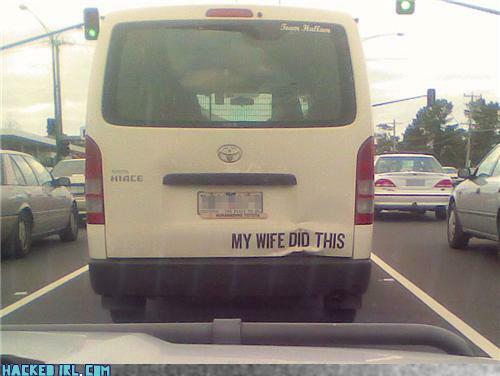 Rather than patching things up after a minor accident, he chose to lash out with a bumper sticker that tells the world what his wife has done. It is a funny picture, but it's all too common in many marriages. Do you play the blame game instead of putting in the effort to fix the problems & make true peace? Pursuing peace is one of the secrets to having love that lasts, but it's not easily done. When confronted with the choice of holding a grudge or offering forgiveness, it's helpful to imagine yourself in the other persons shoes (not literally "in" their shoes- that wouldn't be helpful at all! =)). For those of us who are Christians, "confessing our sins to God is, for the most part, rather easy. We very much want His forgiveness & we know that He stands ready to forgive. But confessing our sins to the people against whom we've sinned is another matter. They don't know exactly how we feel on the inside. They might not be willing to forgive. They might not forget. They might hold a grudge. They might use this against us sometime in the future. They might lose respect for us. They might lose trust in us & not give us the chance to earn it back. They might reject us..."
So many of us consider these possibilities & are tempted to cover up our own wrongdoing, hoping we'll get away with it. 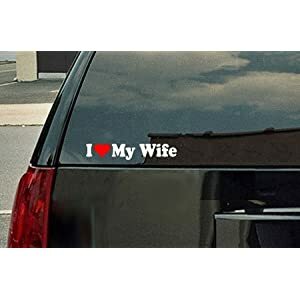 While the offended spouse (out of fear, anger, or sadness) is tempted to lash out like the man with the bumper sticker & say "I'll get even with you! Next time you'll think twice before hurting me (or my precious white van)." But what if couples agreed to offer true forgiveness, regardless of the pain they feel? What if they committed to forgive the same way that God forgives, not because it's easy but because it's excellent? Can you imagine the freedom it would bring to a relationship? Can you imagine the healing that could take place there? Forgiveness is so costly to the giver & so precious to the receiver. Will you offer it? p.s. Turns out there the guy with the bumper sticker just didn't shop long enough. Here's a $4 alternative that would probably make his wife feel like a $1,000,000. Ross - still checking your blog from time to time. Loved this post. I even used it on our blog - giving you credit, or course! Hope y'all are doing well. God bless you.